The Party Wire, this Norman Rockwell painting, appeared on the cover of Leslie's published March 22, 1919. This was the sixth cover by Rockwell to appear on Leslie's and the only one in 1919. Only six Rockwell covers were published by Leslie's from 1916 to 1919. Rockwell only submitted to this smaller magazine after the bigger publishers had declined to publish the cover illustration. This painting was also reproduced on the back cover of April 1920 issue of The Telephone Review magazine. However it was printed in black and white, instead of color. 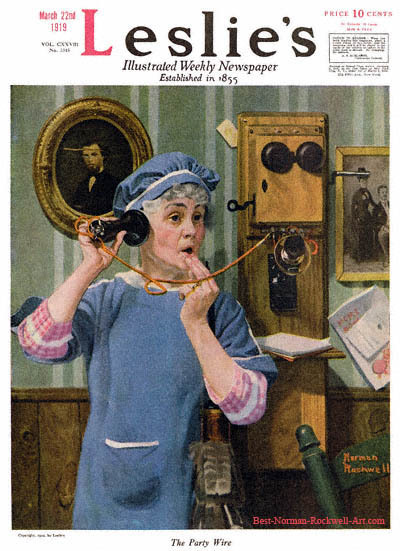 Well, it would appear that there were no private telephone calls in rural America in 1919. At that time, and even later, the party wire was how most telephone service was provided. In the United States, before World War II, party lines were the usual way that residential telephone customers accessed local phone service. The party wire was handy in case of emergency, such as fire. However, privacy on the telephone was virtually non-existent with a party wire such as this. This lady is proof of just how public private conversations could be come. And quickly. This lady has apparently just overheard something. Whether she is shocked, amazed or merely amused, her facial expression conveys speechlessness. We do not know whether she accidentally picked up the telephone receiver on purpose or not. We do, however, know that she can hang it back up any time she pleases. Apparently, she gets some enjoyment out of being shocked! Hang up the phone, lady .